I first had the pleasure of meeting Stuart Neville at the Killer Books Crime Festival in Derry last November and vowed to catch up on his books as soon as I returned to Dublin. 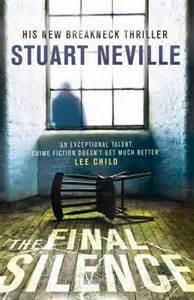 I’m glad I eventually fulfilled that promise – I enjoyed The Final Silence so much that Neville has been added to my ever-growing list of favourite writers. I’ll be interested to hear what you think. You can read the full interview on writing.ie by clicking here. Rea Carlisle has inherited a house from an uncle she never knew. It doesn’t take her long to clear out the dead man’s remaining possessions, but one room remains stubbornly locked. When Rea finally forces it open she discovers inside a chair, a table – and a leather-bound book. Inside its pages are locks of hair, fingernails: a catalogue of victims. Horrified, Rea wants to go straight to the police but when her family intervene, fearing the damage it could cause to her father’s political career, Rea turns to the only person she can think of: DI Jack Lennon. But Lennon is facing his own problems. Suspended from the force and hounded by DCI Serena Flanagan, the toughest cop he’s ever faced, Lennon must unlock the secrets of a dead man’s terrifying journal.